I will not give my enemy 24 hours to get off Earth and never return. Previous posts in the "When I'm the Evil Genius" series. 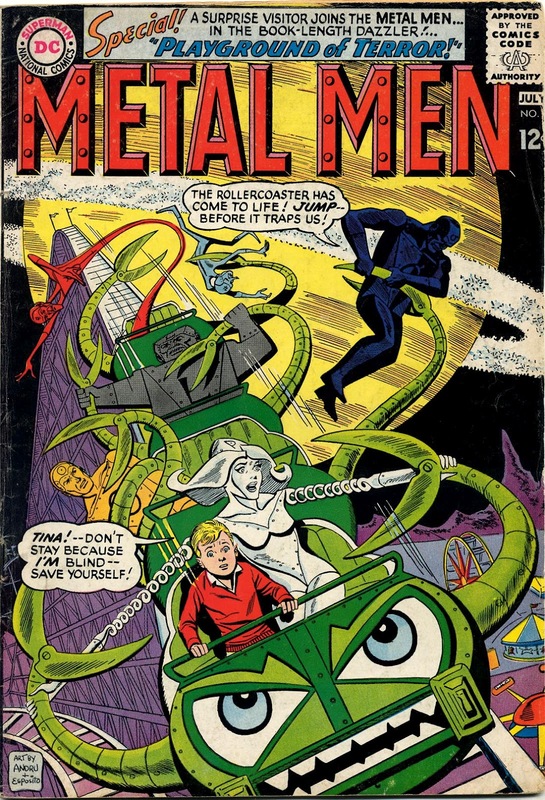 I got the hankering to read a bunch of Metal Men issues in a row, and rather than try to cover the plots and such I thought it might be more interesting to talk about overall impressions from the run. His last command was to catch him, but she fails to bring him back to the surface, and he only survives because the other Metal Men save him. So he scraps the new platinum robot and they return to the moon and eventually find enough of Tina to revive her, gushing her love for Doc and all. At the end of that story, Tin is lost in space, having turned himself into a can to capture a giant amoeba from the moon that came back with Tina. 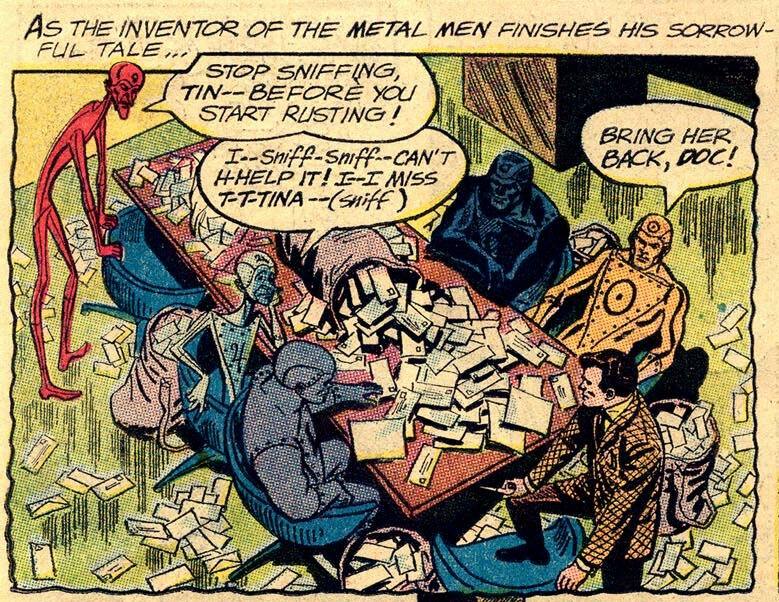 So the next several issues involve the Metal Men rescuing Tin, first from space and then from the clutches of a mad robot queen on another world. 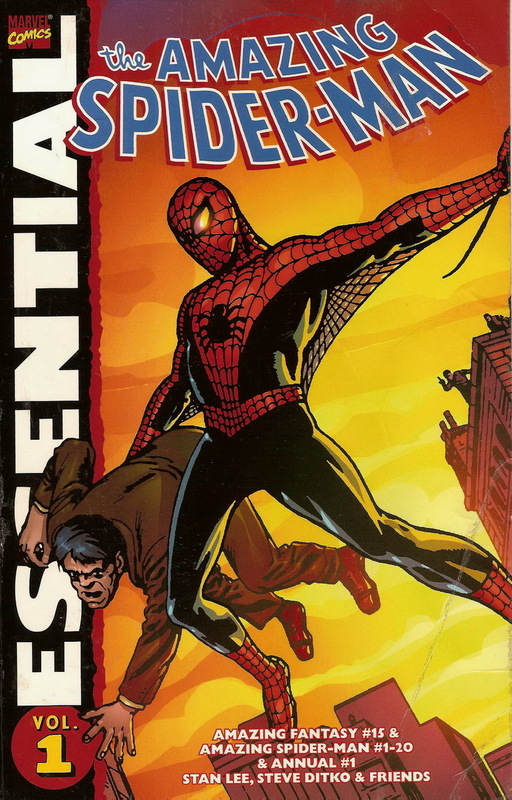 There is certainly plenty of bickering going on within the group; it is obvious that Robert Kanigher, who both wrote and edited the series was picking up on Stan Lee's efforts with the Fantastic Four. 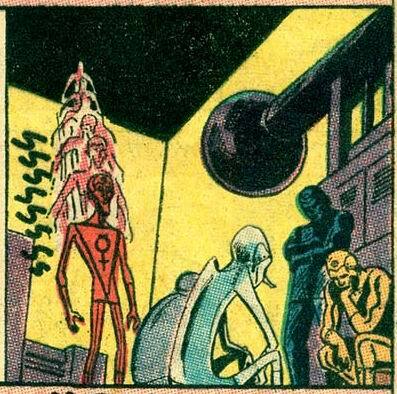 Mercury's always riding Tin and Tina and Doc is constantly frustrated at her amorous advances towards him. 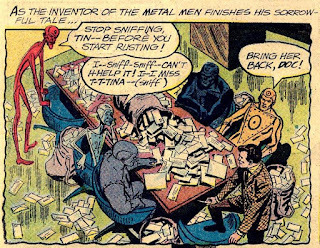 So that's two elements of the Marvel magic that are featured in the Metal Men. What are the differences? 1. The pressure is never racheted up progressively. Instead, there is a threat, then a resolution, then another threat and a resolution. 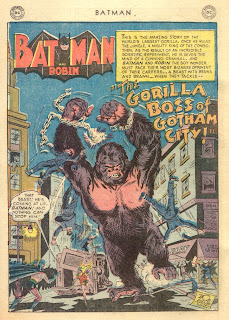 I've talked a bit about George M. Cohan's famous description of a three-act play: "In Act I, you get the hero up a tree. In Act II, you throw stones at him. In Act III, you get him down from the tree." 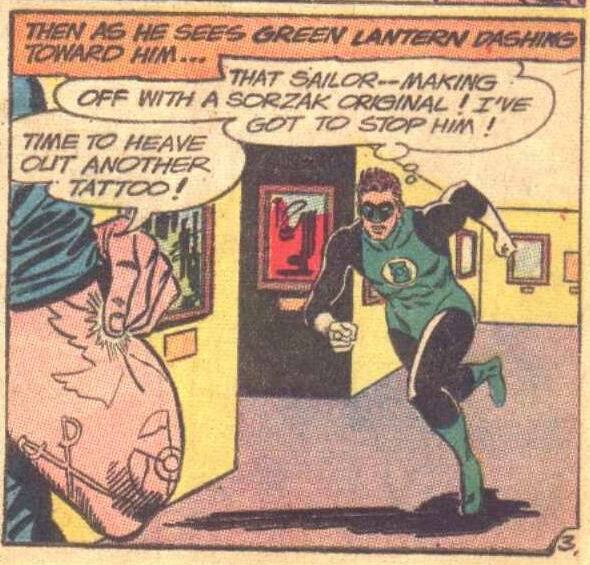 Kanigher always made sure to get the hero down from the tree before throwing stones at him. They're not really menacing, just kind of clownish. 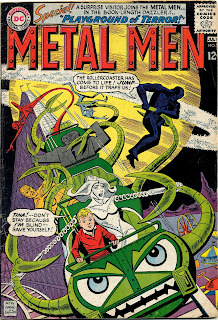 And it does stretch credulity a bit that the Metal Men keep finding these other planets where there are robot rulers and attacking amusement rides. 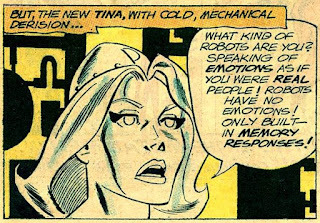 Although there's really no particularly logical reason why chloroform, for example, would affect robots, who presumably don't breathe. The educational aspect is frequently mentioned in the letters to the editor, but this mostly consists of mentioning the melting/boiling points of the various metals and Mercury's frequent observation that he's the only metal that's liquid at room temperature. Overall, I found the run entertaining and while silly at times it's not tiresome. I was not a fan of Andru and Esposito's art as a youngster, but I confess that it's grown on me over the years. 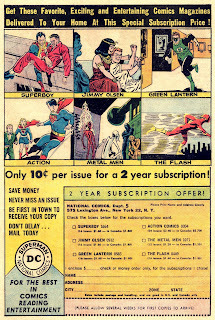 It's certainly a good deal; 10 cents an issue (by then the cover price was 12 cents). 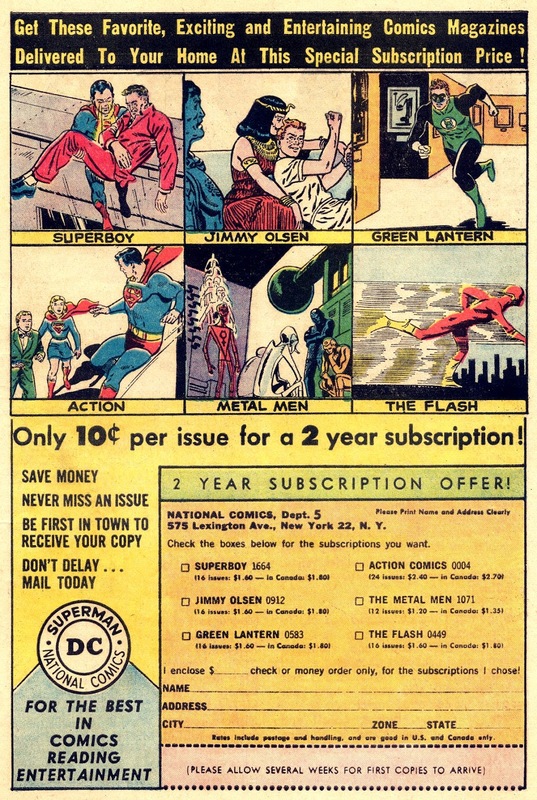 I seem to recall that advertisers paid a higher rate for subscriber copies than just regular off-the-rack purchases, and of course DC got all the money instead of splitting it with the retailer. However, since comics were mostly an impulse purchase, the actual number of subscribers was tiny compared to the overall readership. In most cases, the subscriptions accounted for less than 1% of sales. Like I said up top, probably not terribly interesting or important, just something I was curious about. 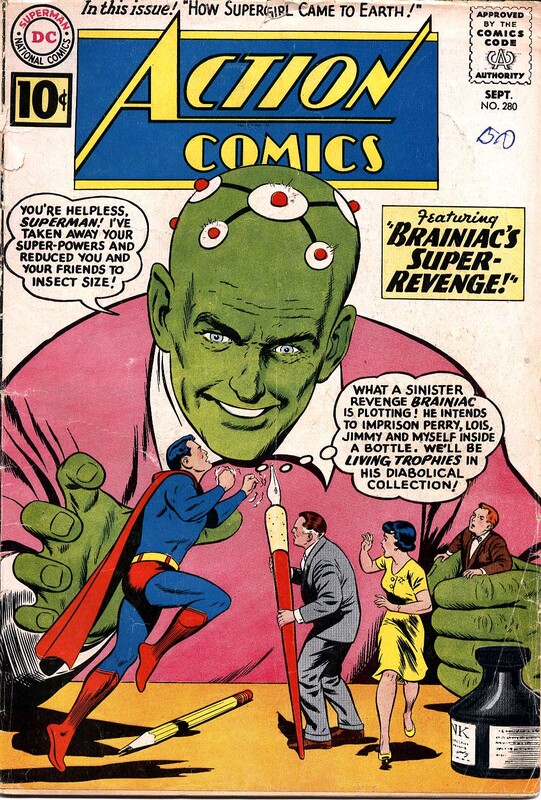 To most of us kids, it seemed as if Brainiac was like Luthor; one of those villains who'd always been around. 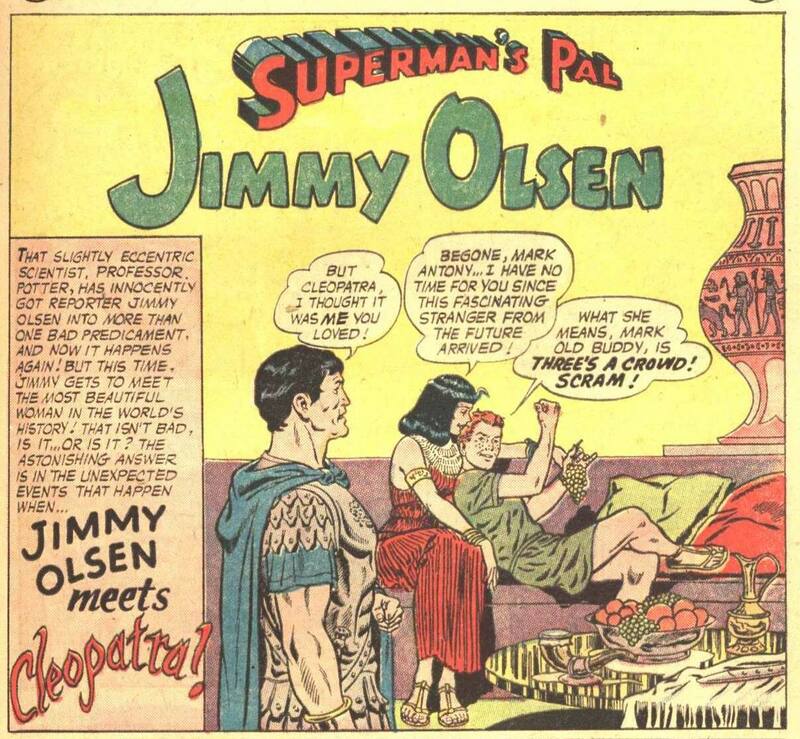 It wasn't until later that I learned that he actually had originated in July of 1958, and thus was only a little over a year older than Supergirl, in comics time anyway. There are a couple of oddities, however. 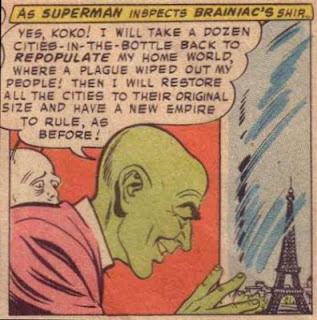 First, why did he only steal one city from Krypton, but multiple cities (including at least Paris, Rome and Metropolis) from Earth? And wouldn't there be issues with expanding Kandor and Earth cities on the same planet? 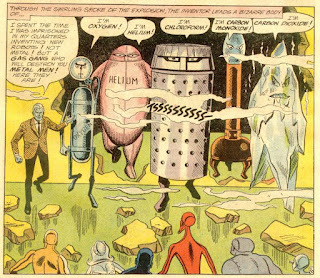 Either the Kandorians would all be super, or the Earthlings would be crushed under the heavier gravity. Superman managed to escape, and restore the Earth cities to their normal size. But when there was only one charge of the enlarging ray left, he was left with a moral dilemma; should he restore himself, or Kandor. Fortunately for us, a rocket ship from Kandor, piloted by Jor-El's old college roommate made the decision, pressing the button to return Superman to his normal size. Brainiac is under sedation for the 100+ year trip back to his home planet. He returns in Action #275. 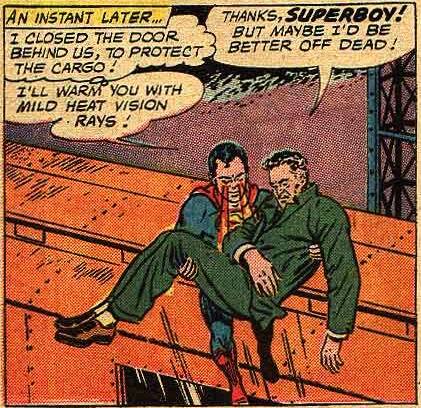 In that story, he beams Superman with a combination red and green Kryptonite ray, which mostly impacts Supes like ordinary Red K. He grows a third eye in the back of his head, which comes in handy as with three eyes shooting heat vision at Brainiac, he is able to dissolve the villain's force field. He sends Brainiac back into the past on some remote planet, reasoning that this will get him out of his hair for awhile anyway. 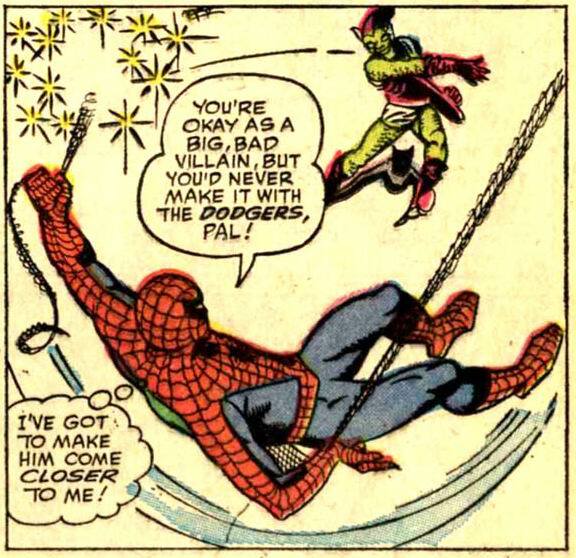 Entangles his foes in a web, you say? 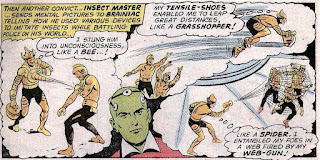 But Brainiac doesn't need any stooges, and refuses to help them out. 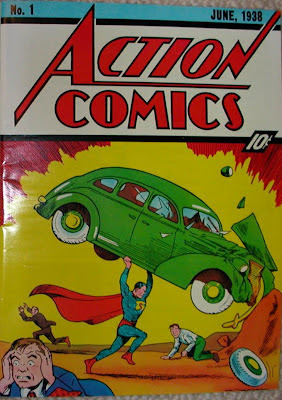 This story does see the return of the bottles, and the shrinking ray, in which Brainiac traps Superman, Lois, Perry and Jimmy, along with Congorilla, who ends up saving them all. 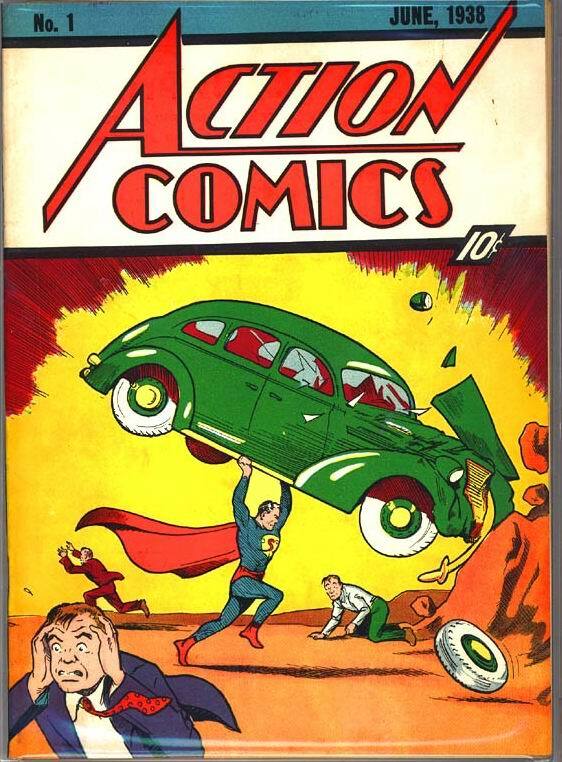 But actually it's just a nightmare that Superman had when exposed to Red K.
Well, it apparently didn't entirely wipe out the population, as he does have those two helpers. 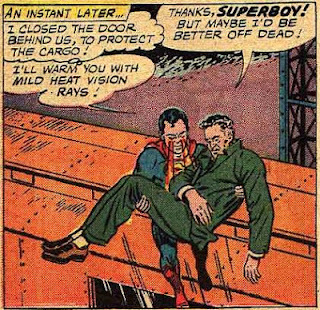 Brainiac intends to hold baby Kal for ransom so Jor-El will give him his latest invention. However, it turns out that Superbaby does have powers on Bryak, and thus wreaks havoc on Brainiac's weapons and treasure, so that they return him quickly to Krypton, vowing to have revenge on that planet. Hence the shrinking of Kandor, which I now must assume was never intended to be restored to its normal size (since the citizens of that city would be super-powered too). 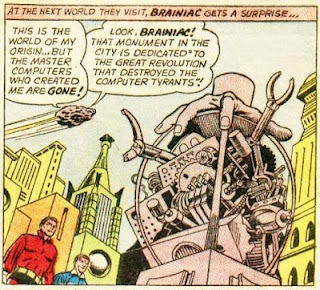 In Brainiac's next appearance, a startling new fact was learned about him: he is a computer! That's pretty cool and unique, but it doesn't fit in with the tale we've been told before about the population of his home planet (which he ruled) being wiped out by a plague. At this point, Brainiac simply serves the other computers, and while they have defeated any resistance by the humans that originally created them, they did not wipe out the population. 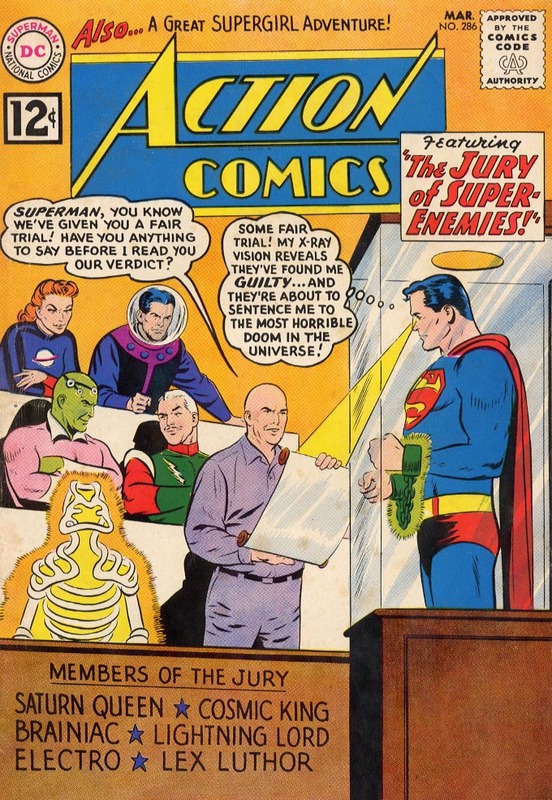 Of course, there's no honor among thieves and once the operation is done, Brainiac decides he doesn't need Luthor. Or does he? Again, it doesn't quite fit the story we've been told about the plague destroying all the people of his homeworld. 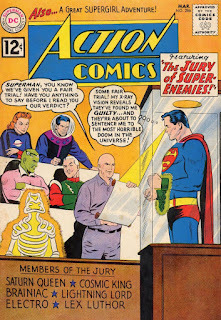 Brainiac and Luthor team up to rob Superman of his powers and shrink him to the size of a small bird. But while they're bickering over who gets to kill him, Superman escapes and sends a message to the Superman Emergency Squad in Kandor. They arrive and make short work of the villains, but in the meantime, Brainiac has put Supes into a coma, from which the finest Kandorian scientists cannot rouse him. 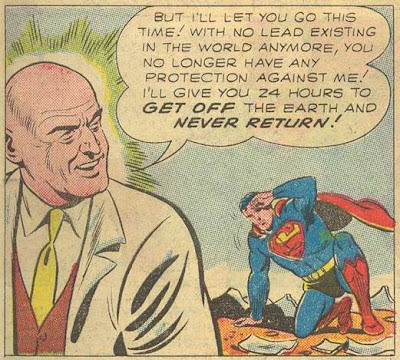 Brainiac makes a deal; if Kandor lets him and Luthor go, he will release Superman from the coma. 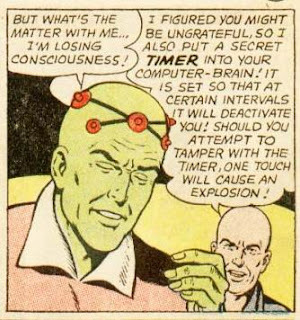 Oh, and along the way, he hypnotizes Luthor into removing the secret timer, and forgetting about Brainiac being a computer. 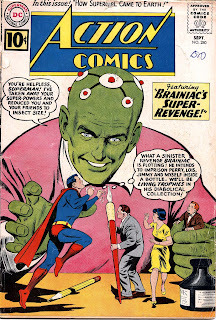 After that, Brainiac pretty much becomes Superman's generic villain from space. 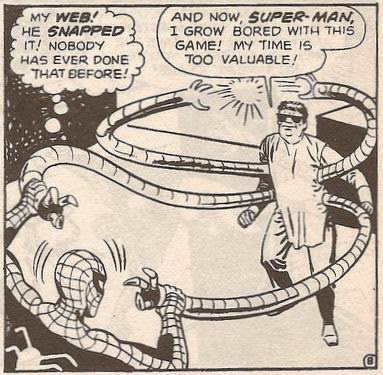 Oh, occasionally we hear about his twelfth-order computer brain, or his hatred for Kandor, but there's no real attempt to fill in the holes in the back story of Bryak, although I assume a lot of that has chanced since the end of the Silver Age. Sometimes the editing goes even deeper than clearing up a simple mistake. I talked awhile ago about Supergirl's first encounter with the Legion of Superheroes, where they explained that they were the children of the original Legion members. 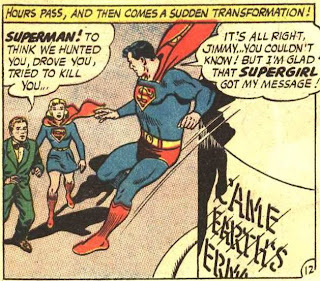 However, later on it was decided to put Supergirl in the same Legion as Superboy, and so when that story was reprinted the text in several panels had to be completely changed. Given that the effect of that change was to make the scene a little less violent, it makes sense to assume that the Two-Face change was made for the same reason. When that comic was reprinted in England years later, the insult was changed to say that the Gobby would never make it as a "fast bowler" (the equivalent of a pitcher in the sport of cricket). 1. There is no white glare on the front fender in the FFE. 2. The man in the foreground is dripping sweat in the original. 3. There are two loose rocks by the front of the car in the original. 4. The running board is yellow in the original, green in the FFE. It was a nice little farewell to Gwen, giving us a reason to feel for Peter's loss. 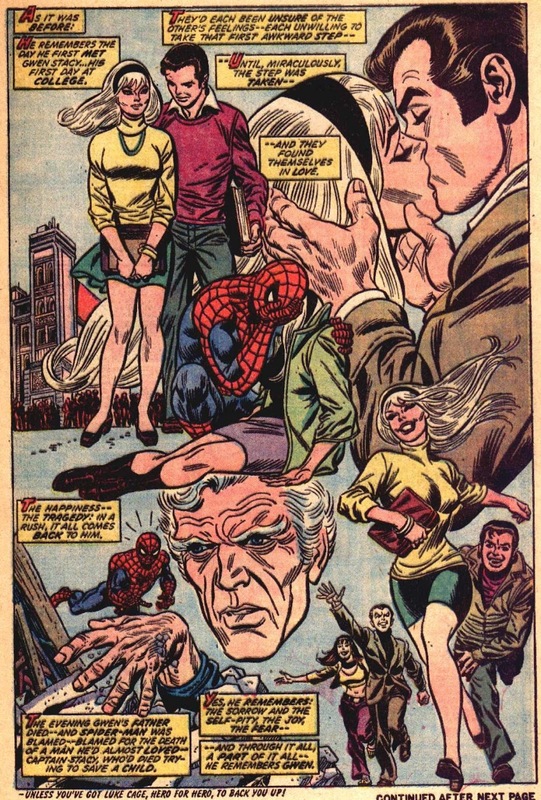 But when the story was reprinted in Marvel Tales #99, that flashback was deleted to get the page count down. If I recall correctly, DC also deleted sequences from the reprinted second part of a two-part story that had originally served to recap the previous issue, since those scenes were now superfluous. 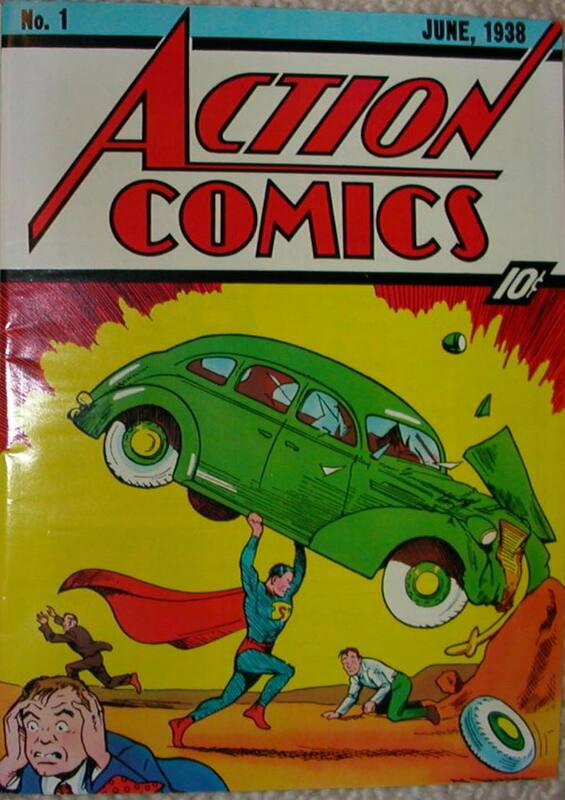 DC also changed the artwork on the story about the deaths of Jonathan and Martha Kent. 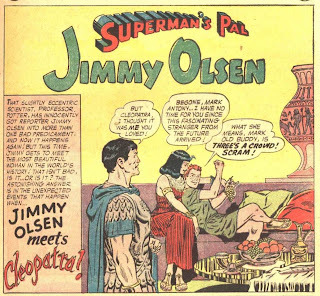 As I discussed a couple years back, DC had printed the story in 1964 or so, with the Kents as oldsters. But in Superboy #145, the Kents were suddenly transformed by an alien TV producer, appearing now as a couple of thirty-somethings. Thus, when the story of their passing was reprinted, their faces had to be redrawn to make them younger. 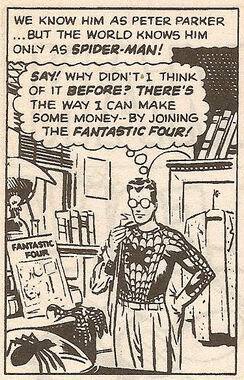 Overall, while reprints are often a cheap way to fill in the blanks of your knowledge of a character, always be aware that what you are reading may not be completely what appeared in the original. Any other examples of reprint problems? 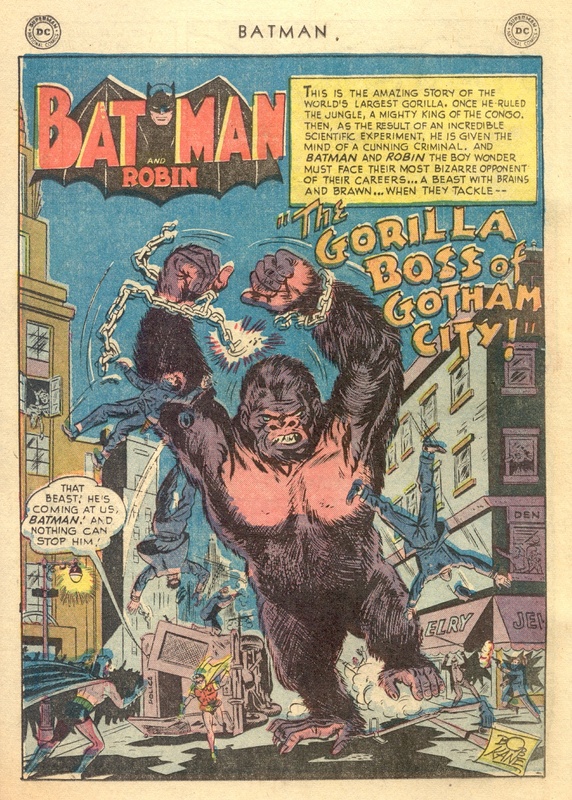 I know, for example, that sometimes DC had their artists trace over old stories in order to reprint them; the Alfred origin in Batman #216 is an example of this. Update: David's Amazing Adventures points out a coloring change in a reprint of the Thor origin story. Update II: Scott Edelman notices a change in Spiderman's origin that took place between Amazing Fantasy #15 and ASM #1. 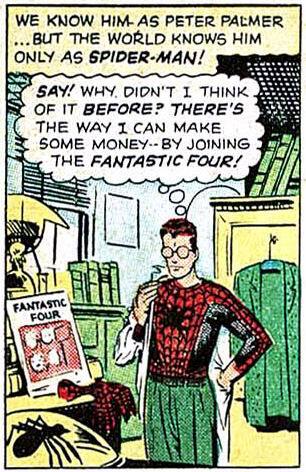 BTW, I think the next time Spidey's origin was retold was in ASM Annual #1, and they went back to the Amazing Fantasy version.